The Melbourne Piano Trio has quickly established itself as one of the most dynamic and sought-after chamber music groups in Australia. The Trio combines the versatile and unique talents of three young Australian musicians: violinist-Holly Piccoli, ‘cellist-Chris Howlett and pianist-Rhodri Clarke. The Melbourne Piano Trio began its 2011 season with debut performances in New York before completing two national tours of Australia, performing in the major concert venues in Sydney, Adelaide, Brisbane and Melbourne. In addition, the Trio toured regionally and was invited to perform at the Bangalow Music Festival and the gala opening of the Melbourne International Chamber Music Competition at Government House. Highlights of the Trio’s 2012 and 2013 seasons included an invitation to appear at the 2nd Chamber Music Competition Hamburg in Germany, concerts at the Melbourne Recital Center, at Sanguine Estate Music Festival and a concert for the Friends of the Sydney International Piano Competition. The Trio tours regularly around Australia and has performed over 40 recitals in the last 2 years. 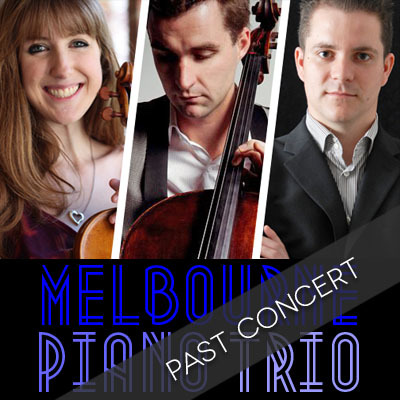 The Melbourne Piano Trio has released two CDs to date, both on the Master Performers label. Violinist, Holly Piccoli is a graduate of the Victorian College of the Arts , the National Academy of Music and, most recently, of Yale University where she has also held a staff position teaching chamber music. Since being an Emerging Artist with the Australian Chamber Orchestra in 2009, she has subsequently toured extensively with the orchestra to the USA, Europe and Asia. Initially awarded a fellowship to study at the National Summer Music Institute in Washington DC, she has appeared in concerts at the Kennedy Centre, at Carnegie Hall and Alice Tully Hall in New York. ‘Cellist, Chris Howlett is a graduate of the Australian National Academy of Music where he studied under Howard Penny. He is a recipient of The Nickson Travelling scholarship which allowed him to study for seven months in Vienna and the Joyce McKenna Scholarship for study from 2009 to 2011 with Richard Lester, principal ‘cellist of the Chamber Orchestra of Europe and member of the Florestan Trio. He has been a finalist in the prestigious Trio di Trieste International Competition and the winner of the Northern Trieste Award and of the audience prize at the Asia/Pacific Chamber Music Competition where he was also a finalist. He has performed as a concerto soloist with orchestras and ensembles in Milan, Rome, Paris and in Estonia and recently made his solo debut in London as a guest of the Tait Foundation and in Dubai, for the Dubai International Concert Committee. He plays a Thomas Kennedy ‘cello made in England in 1820. Pianist, Rhodri Clarke, originally from the UK, is a graduate with first class honours from the Royal College of Music in London. He has recorded for the Deutche Grammaphon label with tenor, Rolando Villazon and the Bolivar Soloists and toured extensively with the group including giving performances at the Berlin Philharmonie, the Vienna Konzerthaus, London’s Royal Festival Hall and Theatre des Champs-Elysees in Paris. He has accompanied Bryn Terfel at Carnegie Hall and given chamber music performances with members of Amsterdam’s Concertgebouw Orchestra and Berlin Philharmonic Orchestra. Click on the image to purchase your Subscription online. Alternatively, visit our TICKETS page to view alternative purchase options. All concerts will commence at 7:30pm. CLICK HERE for our INSTAGRAM profile.